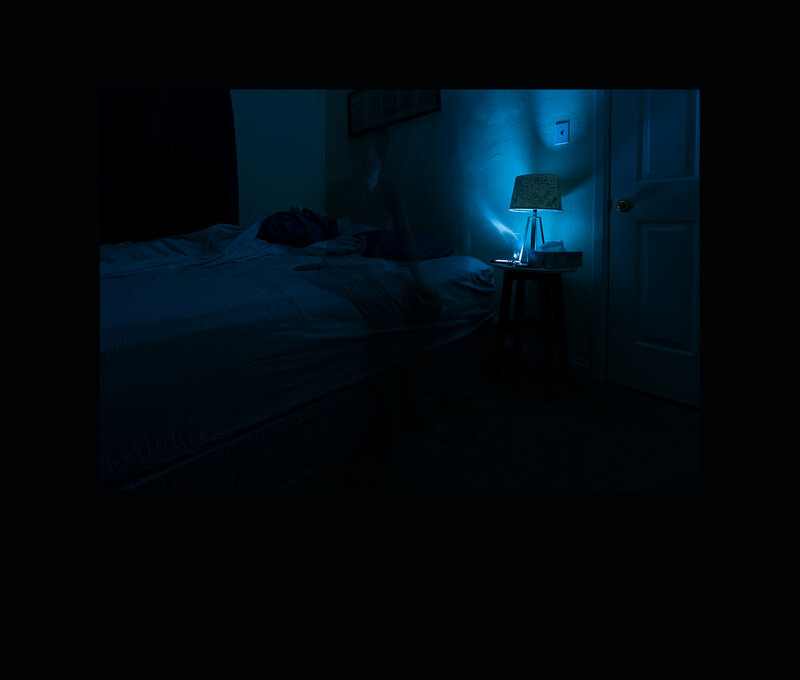 My self-portrait project, Nightlight, is a series of long-exposure photographs created in 40 different homes. From February - October, 2017 I traveled to 40 different homes in Phoenix and surrounding towns; Bisbee, Prescott, Gilbert, Mesa, Scottsdale, Tempe, Goodyear, Chandler, and Payson. My series of images are made upon first waking in the murky blue darkness an hour before dawn in 40 guest bedrooms. Self-portraiture can be a solo endeavor, with a long history as a reflective practice for the artist through which they question, explore, and deepen their personal relationship with their creative processes. With Nightlight, I wanted to question and explore through the lens of community. My mobile phone is the sole source of artificial light, the “nightlight.” The resulting self-portrait images contain ghostly double-exposures, transparent shadows, and slept-in beds. I am seen “as-is” - revealing an acceptance of time, place and self. The room is not staged; I am not coiffed nor dressed for the camera. These images are personal, yet the project is public.This paradox, a yin-yang or introvert/extrovert undercurrent entices me. Searching for and scheduling 40 hosted sleep-overs in 40 different locations, with 40 different families invites/encourages/coaxes me and the host(s) into a deeper reflection and exploration of my art and artistic expression. Through the ordinariness of the sleep-over occasion, together we can then experience the graciousness of shared time, space and human connection. We can build community and experience fellowship. I set the number to 40 for three reasons; 1. to be able to reach my goal within in one year (2017), 2. to ensure I would create a large enough volume of images and 3. To be able to meet and stay with people outside of my immediate friends and family circle. 10-12 photographs printed and mounted - 34” x 40” Digital C Prints, see images in DropBox, images are titled by the date they were made. Images are shown as they will be printed. Project notes with drawings, diagrams and plans. Tiny time-lapse videos showing the making of the diorama. Short audio clips - featuring my “after effects” - short narratives describing how the project impacted me emotionally and psychologically. The photographs, diorama and behind-the-scenes materials offer viewers three distinctive mediums to connect with. Paradoxes await the viewer of the show too because the images are revealing and concealing at the same time focusing on a time of day when who we are is not yet fully put together, packaged, and polished. Each viewer can step into these images as their experiences of predawn are reflected for them. Their worries, their aspirations, their success, and their failures merge with mine as they experience this project. I successfully launched and fulfilled a Kickstarter campaign, fulfilled 100% on 10/27/17 - funds raised are earmarked to produce an exhibition of this project.